waw036292 WALES (1951). 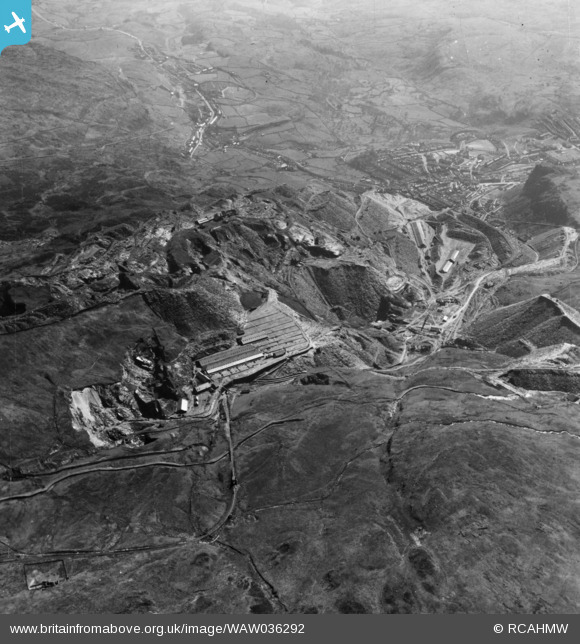 General view of Maenofferen and Fotty Bowydd slate quarries with Blaenau Ffestiniog in the foreground, commissioned by Oakley Slate quarries Co. Ltd.. Oblique aerial photograph, 5Ã‚Â½" cut roll film. Title [WAW036292] General view of Maenofferen and Fotty Bowydd slate quarries with Blaenau Ffestiniog in the foreground, commissioned by Oakley Slate quarries Co. Ltd.. Oblique aerial photograph, 5Ã‚Â½" cut roll film. Train heading for Blaenau in or just leaving Manod station.